TOKYO (AFP) – The euro plunged to a four-year low in volatile Tokyo trade Monday as fears about eurozone debt continued to hammer the single currency and regional stock markets. Sentiment remained fragile despite an EU-IMF rescue package worth almost a trillion dollars designed to prevent the Greek crisis from spreading, as fears grew that the single currency is at risk of collapse. The euro fell to as low as 1.2243 dollars in Tokyo trade -- its lowest since April 2006 -- from 1.2358 in New York Friday. It later recovered slightly to 1.2277 in afternoon trade. Tokyo shares dived 2.17 percent, or 226.75 points, to close at 10,235.76, while Shanghai closed down 5.07 percent, or 136.70 points, at 2,559.93 and Sydney plunged 3.12 percent, or 143.9 points, to 4,467.2. Hong Kong dived 2.48 percent by the break. The eurozone rescue package was initially greeted with optimism but has since failed to reassure sliding markets, with Europe's growth prospects stymied by belt-tightening measures announced by Spain, Portugal, Italy, and France. "Concerns that severe fiscal austerity in the eurozone will crush growth in the region continue to weigh" on the euro, said John Kyriakopoulos of National Australia Bank in Sydney. "Investors are questioning if tightening fiscal spending really is the right thing to do because it would have a negative impact on the economy," said Hideaki Inoue, chief forex manager at Mitsubishi UFJ Trust and Banking Corp.
"The entire economic outlook is becoming increasingly grim." There was some support from figures showing Japanese machinery orders, considered a leading indicator of corporate Japan's appetite for spending, rose a better-than-expected 5.4 percent in March from the month before. Regional markets followed European and Wall Street stocks lower. On Friday the Dow dropped 1.51 percent on escalating fears for the health of the eurozone. "While a financial safety net is in place (in the eurozone), that doesn't remove the considerable economic concerns that burden that region," Jamie Spiteri, head of trading at Shaw Stockbroking in Sydney told Dow Jones Newswires. 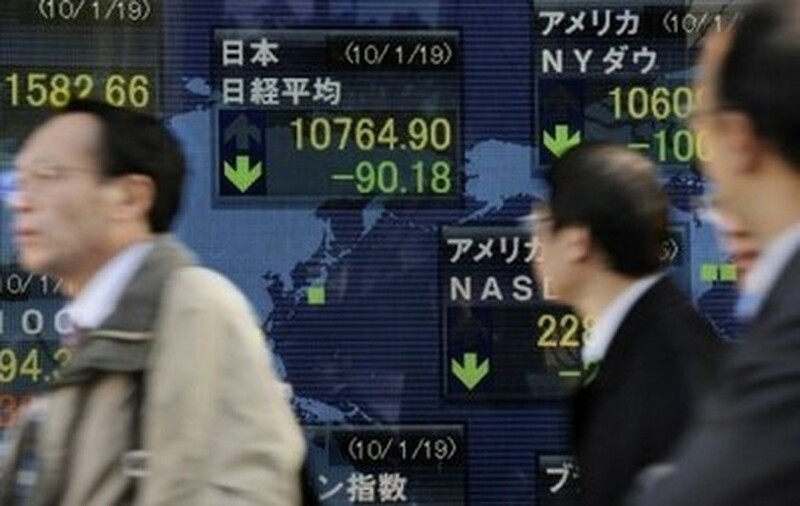 Stocks in Japanese exporters extended losses, with their overseas profits threatened by the euro's weakness. Sony was down 4.50 percent and Kyocera lost 2.87 percent. "The market has no confidence in the euro," Mizuho Corporate Bank market economist Daisuke Karakama said, noting the single currency was lower even though there was no fresh news to drive it down. Gold has soared to record peaks as investors exit the single currency in favour of safe haven investments, with the precious metal opening at 1,237.00 US dollars in Hong Kong, down from Friday's record high of 1,249.40 dollars. The debt crisis began as Greece teetered towards default, triggering fears that other weak economies such as Portugal, Spain and Italy may be next. Worries that a possible debt default by Greece could hit the world's financial system in the same way the collapse of Lehman Brothers did two years ago have sent shares and the euro plunging. IMF chief Dominique Strauss-Kahn said Sunday that European nations had taken too long to respond to the Greek crisis. Athens is now paying a painful price for its past overspending with the government forced to slash civil servant pay and pensions while raising taxes as a condition for the 110-billion-euro EU-IMF bailout. The IMF and EU agreed the Greek bailout only at the beginning of May, and a week later were forced to put together the trillion-dollar euro rescue plan as investors continued to dump the currency and European shares. Greek Prime Minister George Papandreou Sunday raised the possibility of taking legal action against US banks, saying they bear "great responsibility" for Greece's debt crisis, according to a transcript of an interview provided by CNN. Thai shares were 2.5 percent lower as political violence continued to paralyse the capital with almost 30 people killed as authorities clashed with "Red Shirt" protesters. Oil was lower. New York's main contract, light sweet crude for delivery in June, tumbled 1.45 dollars to 70.16 dollars a barrel while Brent North Sea crude for July delivery slid 1.36 dollars to 76.57 dollars. -- Seoul closed 2.60 percent, or 44.12 points, lower at 1,651.51. -- Taipei ended 2.23 percent, or 173.41 points, lower at 7,598.72. PC maker Acer dived 6.9 percent to a eight-and-a-half-month low of 75.20 Taiwan dollars, while Taiwan Semiconductor Manufacturing Company was off 3.3 percent at 59.20. -- Manila closed 1.23 percent, or 41.11 points lower, at 3,289.31. Philippine Long Distance Telephone Co. fell 0.19 percent to 2,500 pesos while First Gen Corp. dropped 2.17 percent to 11.25 pesos. But Metropolitan Bank and Trust Co. gained 1.77 percent to 57.50 pesos. -- New Zealand fell 0.64 percent, or 20.27 points, to 3,170.74. Telecom shed 1.4 percent to 2.07 New Zealand dollars and construction company Fletcher Building ended down 0.2 percent at 8.16.